Holi, the festival of colors, for some, it's just about splashing gulal, going filthy, arresting others and throwing them in the pool full of muddy water, but for others, it's quite the other way. My kiddo mind just can't help itself going back to those cuddly-buddly childhood days, especially when it's Holi and then on the top of that, when I don't happen to be in the 'Land of Colors'. The vivid memories of past, from waking up as early at 7am on a holiday to polishing your whole body with oil and cold-cream, this all can never be drawn blank. I remember gearing up in the morning before anyone could arrive, assembling all the possible colors, from dry gulal to pakka rang, even some silver tubes with that pungent smell. And then arranging gulab-jamuns and some 10 varieties of sweets and savories, also some grapes in those glass and steel bowls; filling old buckets with water and keeping them outside; pumping water into the flyseck red, yellow, green balloons, and finally getting dressed in some quondam clothes which had all the rights to go dirty. The day always used to begin with a bountiful smile, and then it used to pass away in a flash like an interesting 3 hour movie. With bags and pichkaris loaded, hair tied in some stupid fashion, the whole gang/toli of around 15 kids would head on. Ringing bells of each and every house in the colony, we were then adorably invited by all uncles and aunties to come over and fetch some sweets. Ornamenting them with some gulal on their face, we collected so many blessings, but the kids in that house, if any, could not rescue themselves from our color-water-terror. Throwing balloons on the back with full force, and watching that 'aah' expression, it always was so much fun. And then running on the roads to catch the only non-colored fellow left was the biggest thrill. Those days were and will always be the best throughout my life; recreating my soul and refreshing it every time I think about. This time on Holi, I was away from the family, away from those colors, but one thing could still connect me to that time: Sweets. Though there was no party, not many dishes to rock the table, but at least some sugar on the palate and some on the plate. I've never been this emotional while writing a post, so I guess it's better that I jump on to the recipe directly rather than flooding the blog and food table with my tears. Peel off the mango and de-seed it. Saving some tiny cubes for garnish, use the rest to form a smooth puree with a blender/juicer. Add the sugar to the paste and swirl it once again to give a quick mix. Now take chilled whipping cream and whip it till soft peaks are formed. 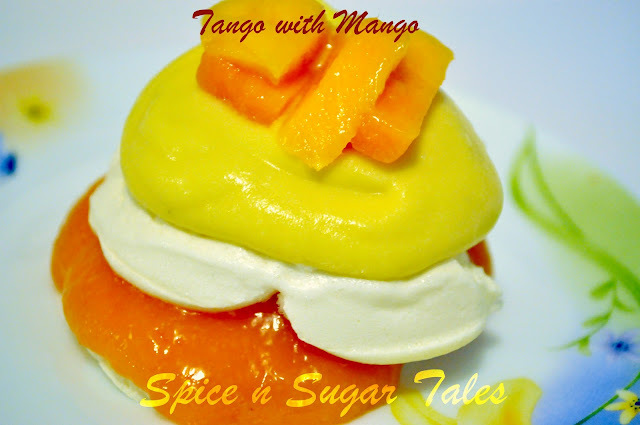 Add 1 tsp sugar, 2 tbs mango puree and again beat for a minute. Now take the ice-cream block and slice it out. Layer one slice on the plate, followed by the mango puree, hen one more ice-cream slice and then the mango cream. Drizzle some cubes on the top and slurrrrrrp. The mango should be fully ripe and sweet. In place of fresh mango, mango puree can also be used. I also added a little gelatin (1 tbs) in the cream and puree to make it slightly mousse-like, but that needs to be set 4-6 hours prior to use. If whipping cream is not available, you can use fresh cream but do not expect any peaks then. 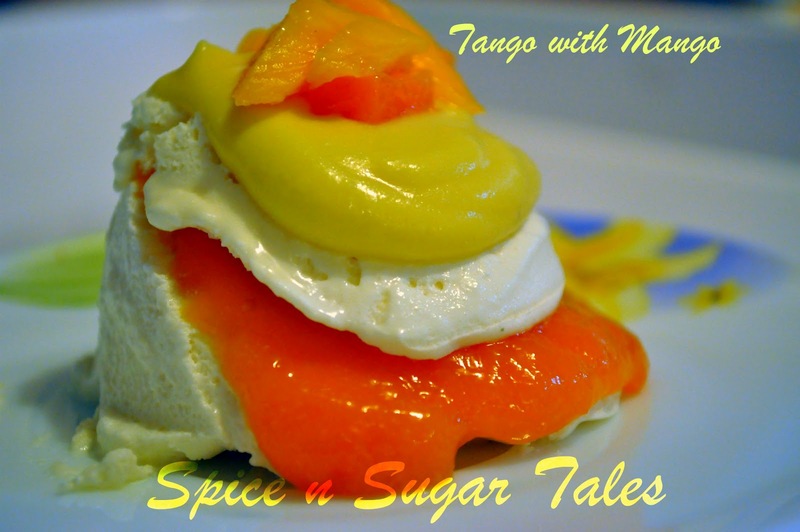 Whip it slightly with sugar and mango puree to get that creamy feel. Serve immediately and be quick in assembling. Rather keep everything ready by your side in different plates and keep shaping. I am not getting mangoes here yet. it looks great. Oh boy, that's a lot of preparation for Holi. I never celebrated it that much back home, although yeah my mom did prepare a lot of stuff, for any festival in fact. The presentation of this dish is quite appealing, by the way! Mangoes are all time favorite of mine! tango with mango looks simply superb! 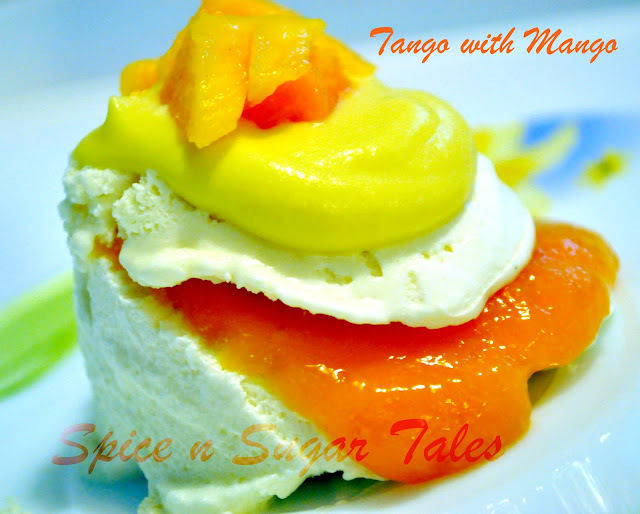 Happy holi and your tango with mango left me with mang o for more. Delicious, love the way you have arranged it, very colorful and tempting.. Very attractive yummy recipe. Thanks for linking my event. So easy but looks like a gourmet dessert!! 5 star ishtyle ;) Love the presentation Anjali! wow!that looks amazing anjali....are mangoes already in season??! 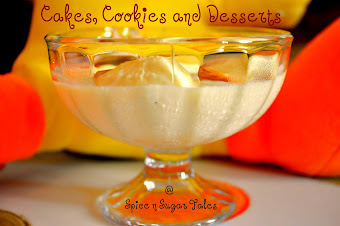 yummy!....lovely recipe! It looks sooooooooooooo delicious and inviting - wowwww! Lovely name & beautiful dish, looks so tempting.